Special recognition is given to signatories for their extraordinary contributions – financial and in service – to the Climate Leadership Network through the Honor Society. This mirrors how our students who graduate “with honors” increase not only their own knowledge but they also contribute scholarship that benefits many networks and communities. Signatories in the Honor Society will receive increased recognition in the Marks of Distinction, as they will be supporting an inclusive and diverse network of campuses striving to implement climate action. Honor Society dues, which are any payment above the amount invoiced, are used to further the reach of the Climate Leadership Network, by funding new resources and initiatives, and by supporting dues for under-resourced schools. 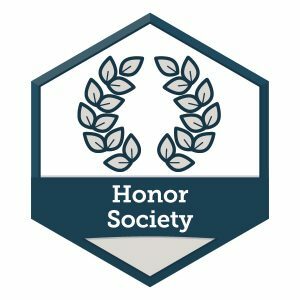 In the 2017-2018 academic year, leaders in the network allocated $40,000 for Honor Society dues. Please help grow the impact this year with your participation; select this option when submitting the annual dues invoice, or at any point in the year. Join them. Starting in 2017, Honor Society recognition is also available through services that have demonstrated a benefit to the institutions in the Climate Leadership Network, beyond the benefit to an individual campus meeting their commitment goals. These actions are designed to improve connectivity and scale success. 1. Host Workshops–Host and organize a one-day regional workshop on Commitment implementation. 2. Host Cross Sector Forum– Host and organize a presidential peer leadership meeting in connection with local government and planning bodies on climate solutions and resilience topics. Implementation Liaisons should provide Second Nature staff updates as activities occur, as we will highlight and give recognition and help in spreading resources to the network. Institutions must be current in Fulfillment through regular and/or Honor Society dues payments and reporting to get this increased recognition. If you would like to receive Honor Society recognition for network service or have any other questions about these activities please contact Janna Cohen-Rosenthal, Climate Programs Director at 617-722-0036 or commitments@secondnature.org.